Porcine circovirus, type 2 (PCV2) and Mycoplasma hyopneumoniae (Mhp) reduce weight gain and cause increased morbidity and mortality either alone or in combination with other pathogens. 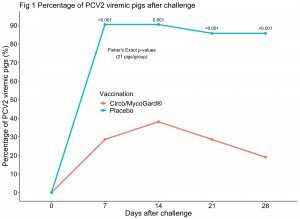 In this study, we evaluated the experimental safety and efficacy of a new 1-mL single-dose PCV2/Mhp vaccine (Circo/MycoGard®) in pigs vaccinated at 10 days of age. Two challenge studies were conducted separately to evaluate vaccine safety and efficacy against PCV2 or Mhp. In the first study, 2 groups of 21 CDCD pigs were either vaccinated with 1 mL of the new vaccine (Circo/MycoGard®) or a placebo at 10 days of age. Pigs were blocked by litter and randomly assigned to either group. PCV2 challenge occurred at 31 days post vaccination (~3 weeks after weaning) and consisted in the administration of a 2 mL mix of 2 PCV2 isolates, both intranasally and intramuscularly. PCV2 viremia and ELISA S/P ratios were determined weekly for 4 weeks post-challenge. Lymphoid tissue immunohistochemistry and lymphoid depletion scores were assessed at the end of the study (28 days post post-challenge) in 3 lymph nodes and tonsils of each pig. In the second study, 2 groups of 24 Mhp-negative pigs had the same vaccination schedule as in the first study. Pigs were challenged with a double intratracheal inoculation of 10 mL of a lung homogenate inoculum containing Mhp strain 232 at both 29 and 30 days post-vaccination. 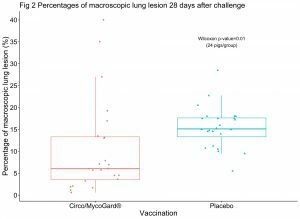 Percentages of macroscopic lung lesion were assessed after necropsy at 28 days post-challenge. Injection site reactions were scored daily after challenge in both studies. Wilcoxon rank sum and Fisher’s Exact tests were used to compared new vaccine (Circo/MycoGard®) vs placebo groups. 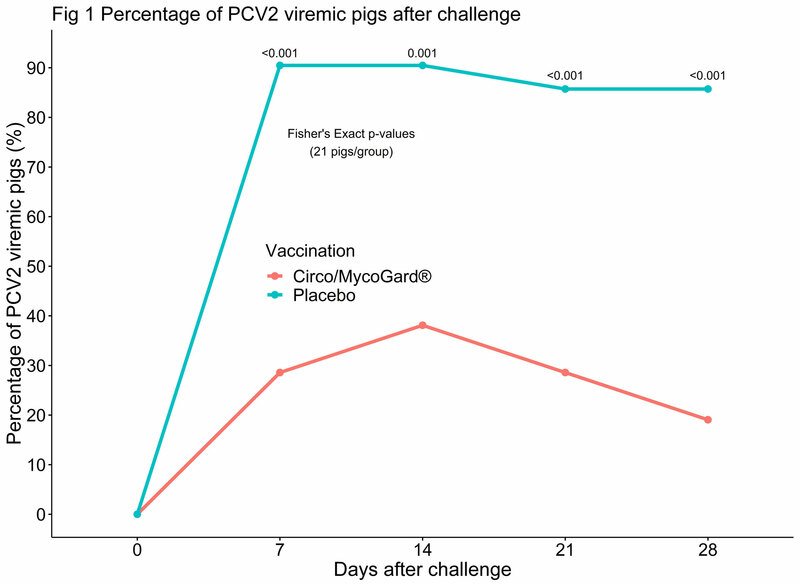 In the PCV2 challenge study, the number of PCV2 viremic pigs over time was significantly lower in the Circo/MycoGard® group compared to the placebo group (p-values <0.001) as shown in Fig 1. PCV2 immunohistochemistry and lymphoid depletion microscopic total sum scores of each pig were significantly lower in the Circo/MycoGard® group (p-values <0.001). PCV2 ELISA S/P ratios after challenge were significantly higher in the Circo/MycoGard® group (p-values<0.01). 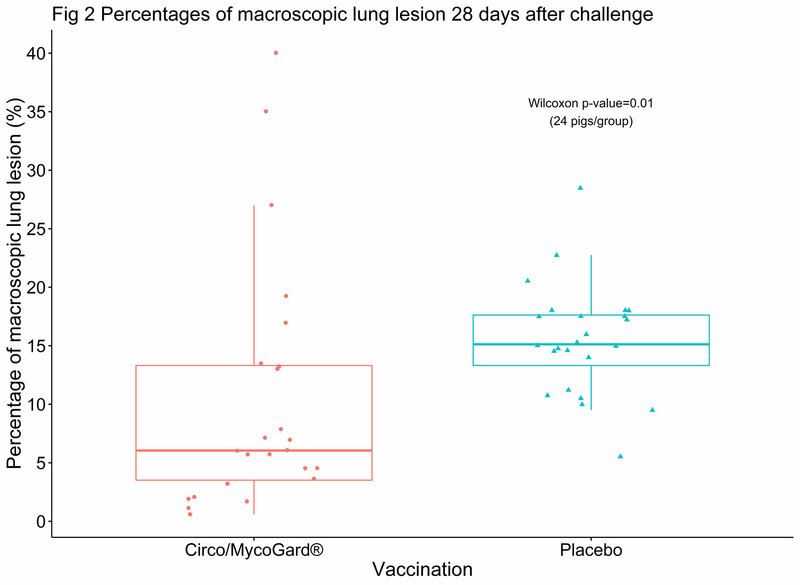 In the Mhp challenge study, percentages of macroscopic lung lesion were significantly lower in the Circo/MycoGard® group in comparison to the placebo group (p-value=0.01). There were not apparent injection site reactions and adverse reactions in any of the studied pigs. The new 1-mL single-dose PCV2/Mhp vaccine (Circo/MycoGard®) was safe and efficacious against PCV2 and Mycoplasma hyopneumoniae challenges in growing pigs vaccinated at 10 days of age.